Someone wants Brett Turner's land badly enough to sabotage him, and he knows just who the culprit is: his neighbor, Willow Howling Moon. They don't see eye-to-eye on anything. When their sons, who are best friends, run away into the mountains just before a blizzard hits, Willow and Brett have no choice but to go after them-together. In the course of the rescue, they discover an unexpected and unwelcome mutual love. The realization that both their lives are in danger finally convinces him she's not his enemy. This heart-warming love story is set in Montana. Brett Turner's farm keeps turning up with different problems and he is quick to blame his beautiful Indian neighbor Willow Howling Moon. 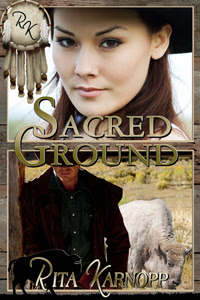 As much as Brett might believe that Willow is out to sabotage him and his farm, he can't help but notice that she is a beautiful woman and despite his hatred for Indians, Brett can't fight off the erupting emotions for Willow running through him. When both Brett and Willow's sons run off together with a plan in motion, to get their parents to fall in love (just like in The Parent Trap), both Brett and Willow are forced to put their problems aside to help each other find their boys. While on this little adventure, Brett and Willow are slowly realizing that they have feelings for each other and soon figure out that Willow is not trying to sabotage Brett's farm, but someone else entirely. Minds set, both Brett and Willow follow their leads to confront their culprit, and soon will be shocked at who the mastermind behind the entire scheme really is. I absolutely love Willow and Brett and loved when they gave into their feelings for each other. Especially, the automatic love and paternal instincts that they felt for the other persons son. I was a bit lost when Brett would go into his dreaming state, it's like there wasn't a buffer there for me saying "Brett fell asleep" it just continued on and on. By the time I was halfway through the dream, I was all "Holy #$@#! That was a dream." lol. But other then that, I really liked this book. Even though I was lost as to when Brett's dream state was occurring, those parts were probably my favorite parts in the book. I liked the fact that Brett was getting in touch with his Indian side even though he was set in his ways and opinions on Indians. I felt these dreams played a big part in him figuring out who he is, so that he could believe in all that "mumbo jumbo" and come to terms with himself. Again with the dreams, those would also double and take responsibility in what I disliked about this book. But, only because I think there could have been a smoother transition from reality to dream. Overall, this book was a good read and I would definitely recommend it. It's not too deep in thriller, but there is some mystery. The lighthearted love story totally makes up for the bad guys! lol. I'm just warning you now that the dreaming parts in this book might throw you off a bit, but if you stick with it I'm sure you'll enjoy it as much as I did.